Will the 2016 presidential election prove more of the same? This second edition provides some interesting insights and facts just as it does for the 2012 presidential election during the GOP nomination process; facts and occurrences that will make you double down! America's Lost Opportunity emphasizes that the American people do not have control over the election process and that there is no free press. The developments and events that were highlighted in this book provide readers the evidence to support these observations. 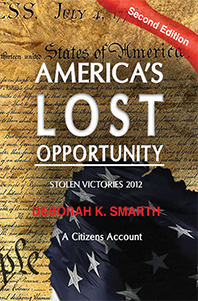 Author Deborah K. Smarth wants to stress the fact that the challenges to the election system require greater vigilance, participation and self-education on the part of citizens so that they have a better understanding to exert greater influence and control in future elections. In her new publication, she unfolds the story about the Republican presidential nomination process from primary and caucuses to state party conventions and the 2012 national convention in Tampa. The second edition also delves into the 2016 presidential campaign with probing observations about the neoconservatives' control and influence over both national parties. *$19.99 includes author's personal signature. Copyright © 2015. Deborah K. Smarth. All rights reserved.